I want to know how to calculate the effective interest rate. Can anyone give me an answer? I am using Casio F100 Financial Calculator, please teach me how to use this calculator to calculate this. 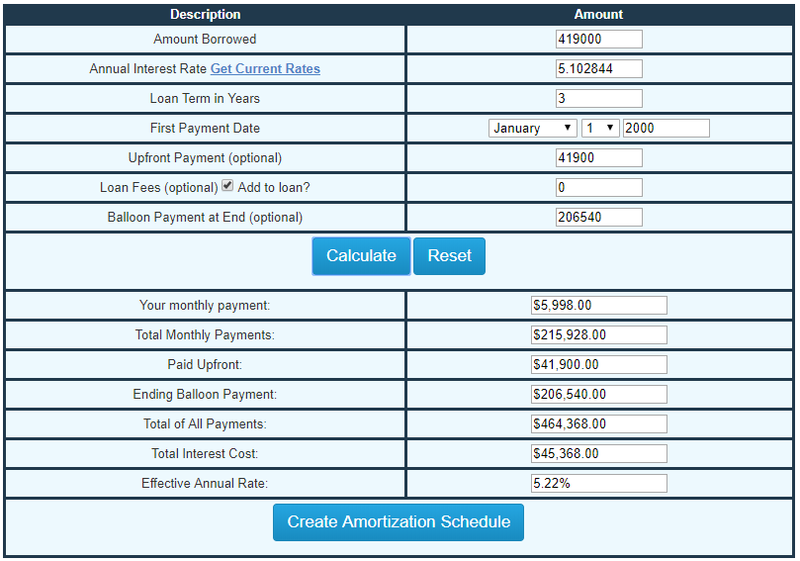 from this web site https://www.mortgagecalculator.org/calcs/balloon.php, it shows the effective interest rate is 11.02% (amount borrowed: 377100, long term in years: 3, Upfront payment: 41900, loan fees: 0, balloon payment at end: 206540, monthly payment: 5988.99) How come the interest rate is much high that we calculated? Please help. With r = 0.00425237 per month, as calculated in the addendum. The results below are based on 36 payments of 5998 plus a final payment of 206540 at the end of month 36. The total paid in month 36 is 212538. Top and bottom of amortisation table. Note the principal amount: 377100. The value of the loan is equal to the sum of the discounted values of the repayments. There is no formula for the periodic rate r. You will need to solve for it using one of the above equations. This assumes full amortisation, i.e. 35 payments of 5998 and a final one of 206540 at the end of month 36. "With full amortization, the amortization schedule has been set so that the last periodical payment comprises the final portion of principal still due."